alaTest ha raccolto ed analizzato 45 recensioni su Babyliss 7420U BODY Groomer. La media della valutazione per questo prodotto è 4.5/5, confrontata con la media della valutazione di 4.3/5 per altri prodotti. Abbiamo analizzato differenti valutazioni di esperti ed utenti, età del prodotto ed altri elementi. A confronto con altri prodotti, Babyliss 7420U BODY Groomer ha ottenuto un alaScore™ complessivo di 86/100 = qualità Molto buono.
" very good price and very powerful. great variety of cuttings brilliant razor for everything "
Babyliss need to up thier game. 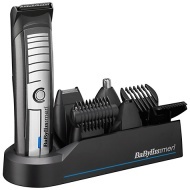 BaByliss for Men 7420U Super Groomer Kit.
" Very good present he loved it "
" Bought this for my son and he says it is the best one he's had , Having had three before. Very easy to use and compact. Would defiantly recommend . " " Very picky husband very happy with ease of use performance and features "
" Overall a good product, however, there isn't a flip up fine trimmer and changing the trimmer heads is a pain mid beard trim. " Overall a good product, however, there isn't a flip up fine trimmer and changing the trimmer heads is a pain mid beard trim.
" Brought as present for my dad he says it's brilliant and loves the nose and ear trimmer would recommend "